We’re loving the features of our latest kitchen updates, including a stainless steel over-the-range microwave from Panasonic. Hello Satori readers! Today, I’m excited to share some of the progress we’ve made on our kitchen. I’m so relieved to almost have a fully functional space after having to prep meals in our make-shift kitchenette in the basement for months. Even better, the changes we’ve made have allowed for new improvements like installing a top of the line over-the range microwave. Let’s face it, a microwave doesn’t usually top the priority list when designing a kitchen. Most people don’t ooh and ahh over one like they tend to do with ranges or countertops. Yet, a new microwave was something we spent a chunk of time researching to ensure we got the right one. You see, our old kitchen had one of those awkward microwave shelves that was not only an eye-sore and dust collector, but also took up valuable cupboard space that we certainly could have used. Most annoyingly, the microwave shifted around each and every time we pressed the button to open it, so we were constantly adjusting it, which caused all sorts of fingerprint madness. Who has time for that? The solution? We combined the functions of a microwave and hood fan into one appliance choice that’s sleek in design and quality in construction. Enter the Panasonic Genius Prestige Plus OTR Microwave Oven with electrostatic glass touch control panel and energy efficient LED lighting. Did I mention the fingerprint-resistant stainless steel? For our family, that’s a stand alone feature. Who wants to be buffing and shining one more thing in the kitchen? Not me. And just look at the space it freed up to install a generous upper cabinet with double doors where the old microwave used to be. More storage at eye level… it’s going to be a life saver! Installation was far easier than expected. Some cuts were required in the cabinet above using the handy template that was included. 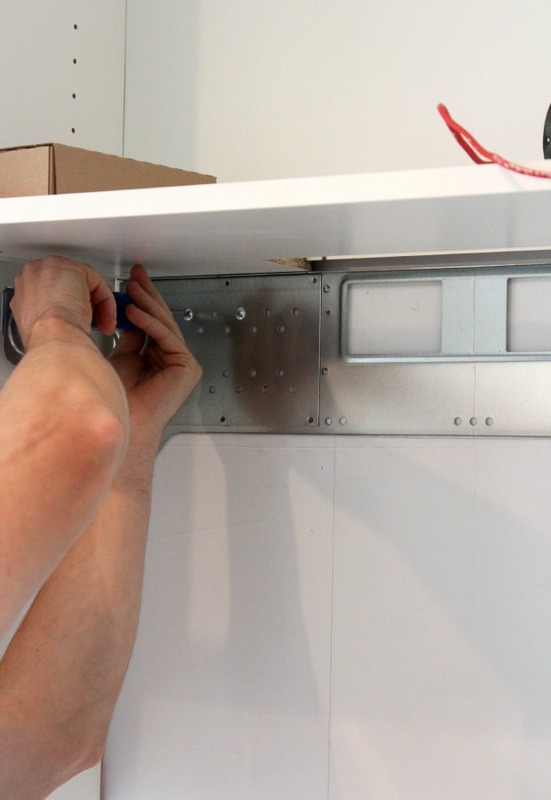 Then we hung the bracket and slid the microwave in place. Another key attribute in selecting our new over-the-range microwave was the quality of cooking. With Panasonic’s inverter technology, the nutrient levels of certain foods are kept in tact much better than with most microwave models or traditional cooking methods. You can say good-bye to “nuking” your food and hello to delicious, healthy cooking results in less time. And what about ease of use? The Genius Prestige Plus Sensor adjusts power levels in order to calculate cooking time automatically. 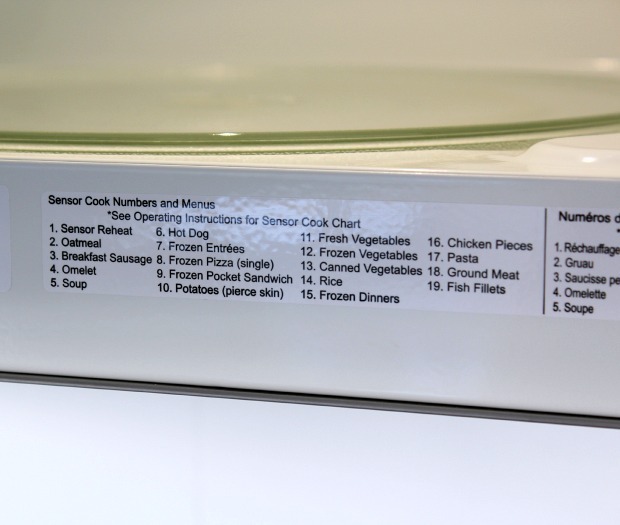 With 19 different cooking settings available, this microwave really takes the guesswork out. That means perfectly cooked oatmeal every time with the press of a button. 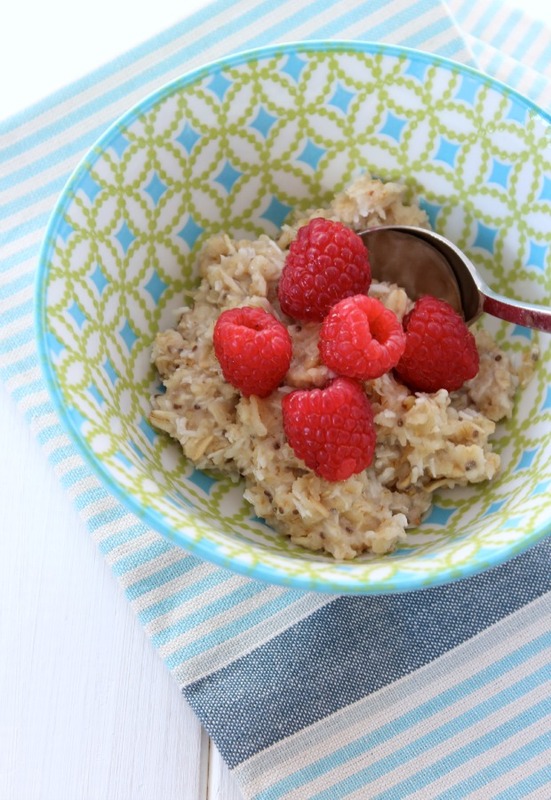 Great for those busy mornings when everyone’s trying to get out the door. More kitchen updates are coming very soon. Our sink and dishwasher finally got hooked up- yippee! Now we’re left with a few final touches, including the backsplash, cabinet hardware and light fixtures. Seems like a doable list compared to what we’ve faced thus far. Click here to see more of our kitchen updates! Disclosure: A big thank you to Panasonic Canada for collaborating with us on our kitchen renovation. As always, opinions are 100% my own. I think your choice is great! I have had an over-the-range microwave (it was a Panasonic as well though a much older version than your new beauty) and I loved the function of it. So handy and a great use of that real estate! Your kitchen is looking so sleek and modern, Shauna. I am excited for you to have it all finished… just in time for Christmas!! Thanks Sheila. We’re really enjoying the modified layout of our kitchen and functions of the microwave. That looks great Shauna!! I sure wish I had an over the stove microwave… sigh… when I re-did my kitchen I was measuring them and thought that they sat too low and I thought I’d bonk my head leaning over the stove. Yours looks like it sits higher – I like that. Hmmm. 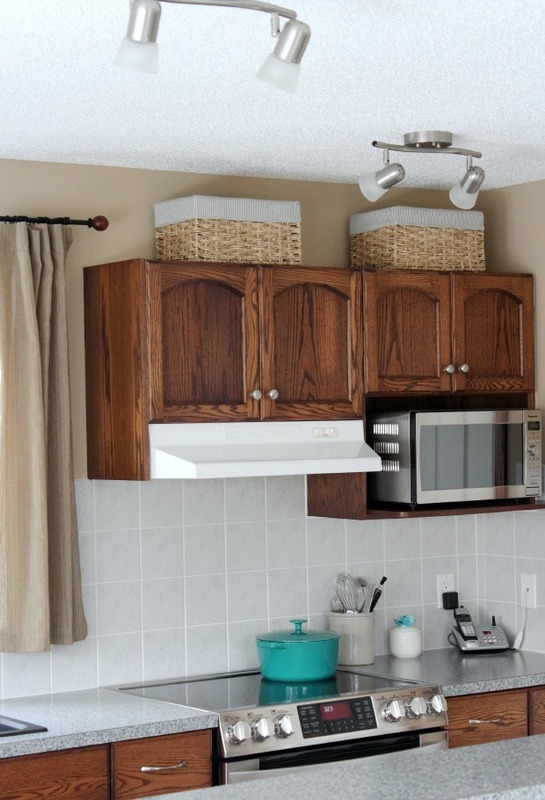 Yes, our new cabinets go to the ceiling making room for an over-the-range microwave. There are building codes that specify how high it needs to be from the stove top and ours works out perfectly. Shauna, it looks amazing! So awesome that you have scored more cupboard space and it fits like a glove over the stove. Beauty. Really love it. Thanks Alicia! It’s so nice to have the extra space for everything. 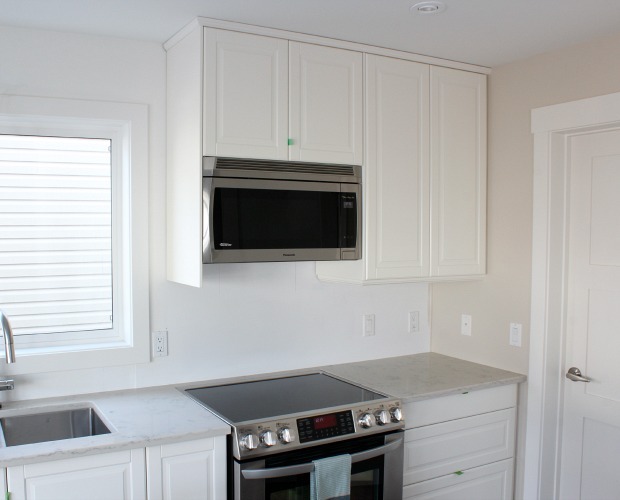 An over-the-range microwave was the best solution for a kitchen with our layout and size. 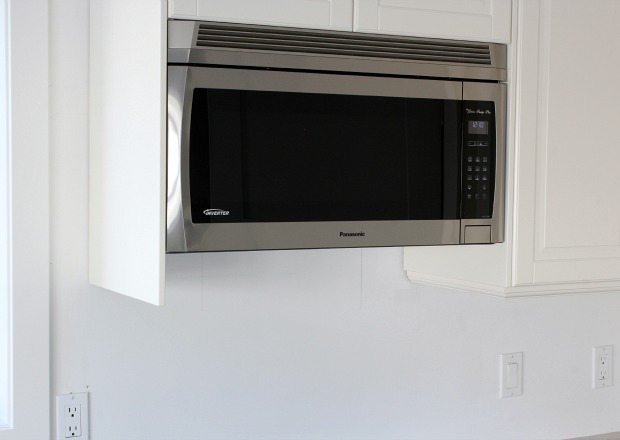 The over-the stove microwave is such a great space-saver, especially with a hood fan built in. Your kitchen is looking beautiful! Thank you Jane! Yes, a true space saver with one appliance instead of two. Couldn’t agree more, Laurie! Yes, we’ve been busy. Can’t wait to add the finishing touches so I can finally share the kitchen reveal. Beautiful kitchen!! What is the brand of the range? Thanks, Erica! The range is LG. Hi Carole, We used the IKEA upper cabinets which are 15″ deep.